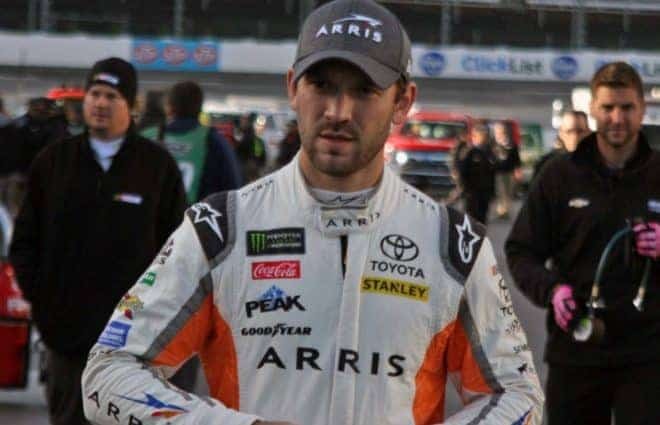 After winning the NASCAR XFINITY Series championship in 2016, Daniel Suarez was fast-tracked to the Monster Energy NASCAR Cup Series, replacing Carl Edwards at Joe Gibbs Racing. Fast forward almost two full years later and he’s still looking for his first victory in the premier series. He’s also now in the market for a full-time ride. Suarez, 26, recorded 12 top-10 finishes in his rookie year. But 2018 has been a bit of a step back. In the first 32 races, the Mexico native has just a trio of top-five efforts and only eight top 10s, down four from 2017. That left him expendable when Martin Truex Jr. came available after Furniture Row Racing revealed they’ll cease operations at the end of 2018; he’s expected to replace Suarez at the No. 19. Meanwhile, Joe Gibbs Racing has won eight races as a whole this season, seven of which are from Kyle Busch, one of the championship favorites. Suarez is surprised he hasn’t seen more success in the No. 19 car. “It’s been really disappointing for different reasons,” Suarez told Frontstretch of his season on Saturday (Oct. 27) at Martinsville Speedway. “We haven’t performed the way that we’ve wanted, but sometimes you have years like that and you have to learn from that and move on and make adjustments. Hopefully, I can learn from this and be better for next year. Suarez picked up his first career pole at Pocono Raceway in late July, en route to a career-best second-place finish. He backed that race up with a fourth at Watkins Glen International, feeling as though the team finally found the results to match the speed it had at one point in the year. But much like Suarez, Denny Hamlin, who has a victory in every one of his seasons in the Cup Series, is still looking for his first win of 2018. The lack of results have been difficult for the second-year driver to comprehend. Following the race at Dover International Speedway on Oct. 7, Joe Gibbs Racing made a change atop the No. 19 pit box, placing veteran crew chief Dave Rogers with Suarez. The goal was to get the No. 19 to perform better, and the driver/crew chief duo have past experience, as it was Rogers who called the shots on the No. 19 for the opening five races of the season in 2017. Rogers replaced Scott Graves, who has worked with Suarez much of his NASCAR career, dating back to their XFINITY championship together in 2016. But Suarez didn’t even know the change was coming. In five races together in 2017, Suarez and Rogers picked up a pair of top 10s at ISM Raceway and Auto Club Speedway. However, the driver wished he was part of the decision-making process of who was going to finish out the season leading the No. 19 team. As for the remainder of 2018, Suarez is hoping to have fun and finish the season off strong with Rogers. Combined, he has a pair of victories in NASCAR’s national touring divisions at Phoenix (Camping World Truck Series) and Homestead-Miami Speedway (XFINITY). Looking ahead, there have been a lot of rumors on where Suarez’s future will be post-JGR. The driver claims he’s close to having a deal done. “A little bit. There’s not a lot I can really talk about yet,” Suarez said. “We are working on some things, and hopefully things are clearer soon. It’s been a very stressful last six weeks with a lot of work. In the last two months, I’ve learned a lot about the sport and about the people. I was not expecting many things, and I’ve learned more in the last two months than the last four years, and I feel like that’s been good as a person. Suarez also believes this was a growing process, learning more about the business side of NASCAR. SHR for Danny-boy Swirv’in Suárez next? Joey: version II! JGR driver management code. Cut the young-guy buck, replaced with a salty old crow! Repeat! Mr Gibbs runs his face teams much as he did the Redskins, with players / drivers as expendable. The landscape is littered with kicked to the curb drivers. still would like to know the REAL Carl Edwards story Will be interesting to see if Suarez does go to SHR and if so, he has a career resurrection such as Aric has experienced. Suarez’s comments about the crew chief change sorta sounds like whining. I assume the crew chief change was prompted by Graves leaving (though I am not sure if Graves was fired once Gibbs learned Graves was changing manufacturer and teams, or if Graves left Gibbs without explanation though Graves knew at the time of the resignation that he would be going to the #6 team, or if there was something else). Maybe Suarez thinks he should have been consulted over who was going to be his crew-chief, but at that point, Gibbs knew Suarez was gone from Gibbs (making Suarez’s opinion relatively irrelevant), Gibbs had to immediately fill the position, and whoever took the position would probably only be a temp, as Truex and his crew chief are supposedly coming as a pair (interestingly, Suarez did not mention who he wanted as crew chief; if he had no preferences, what input was he going to provide in the decision making). Toyota might have wanted to keep Suarez, but Toyota has a very limited number of driver spaces in cup. Unfortunately, Suarez lost out on a game of musical chairs within the Toyota teams. If you want to learn a lot about people, become a bar tender. If you want to race in NASCAR for a premier team WIN RACES! Another Not Ready For Prime Time player. Daddy’s ( or Go Daddy’s) money can’t buy wins in Cup. WowI I guess his Daddy restored a lot of Volkswagens to finance Daniel’s team, huh???? Not to belittle a talented driver, but Arris bullied their way into the Suarez situation and blocked Eric Jones for a full year and probably impeded JGR’s plans for Christopher Bell. Now Daniel will pay the price since the Gibbs clan is still smarting two years later. Good bye Arris, goodbye Suarez, Truex is a far more polished racer who will bring substantial backing…. Matty; You must be referring to all the Truex backing that is keeping the 78 going…OOPS guess not.